Red's a primary colour, and is seen everywhere, so why don't you see more red paintball fill? The obvious answer is that it resembles (to varying degrees) that other red liquid, blood. In the end, commercial paintball largely frowns upon this comparison, and subsequently red paintball fill is somewhat of a black sheep in the paintball industry. In fitting with a milsim play style, paintball fill that looks like blood does evoke a certain sense of authenticity to any elimination. A goggle lens soaked in gooey red liquid conjures a visceral reaction from the wearer, while adding to the realism of the game. 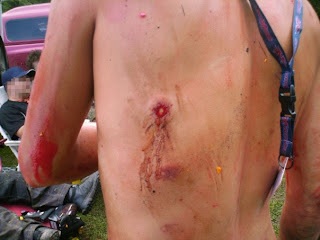 The inability to distinguish between real blood and paintball fill. The public image drawn from paintballers using fill that looks like blood. A mixture of blood and paint. 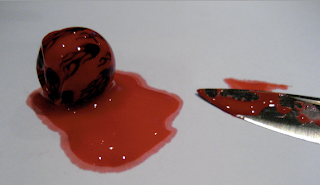 The obvious reason for the indistinguishability between blood and paint being a problem is that you can't tell when you're bleeding or seriously injured. In looking at the picture above, you might not realize that the hit is actually bleeding. In addition, some players may overreact to being hit if the paint looks like blood. 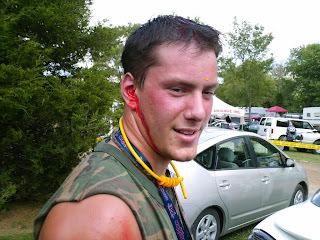 A story related to me on a forum went as follows: A player was hit on his goggle lens during a local BYOP game with a red paintball, and was unable to see out of his left eye. Thinking that he was hit through the lens and there was blood everywhere, he screamed and whipped off his mask, and was left vulnerable to potentially dangerous paintball hits. As a result of this incident, red paintballs were subsequently banned from this establishment. By using paintballs that look like blood, anti-paintball media is given easy cannon fodder. It only feeds uninformed and uninterested pundits that feel that paintball is some kind of juvenile hyper-realistic ultraviolence. This isn't written with the intent of banning red fill or scaring people against using it. 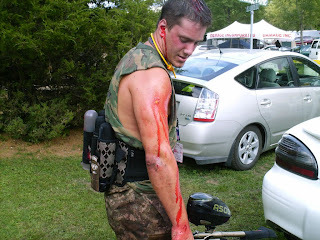 But if you do use it, for your sake and the sake of paintball as a whole, be smart about it. A special thanks goes out to Jake, thanks for all your help! That paintball at the top is grade A paint! Great article! My only complaint is the comment about cleaning. I personally have had worse experiences with some orange or white paint staining then any of the blood red fill paint Ive shot! Just food for thought! Actually The largest field in Michigan Hells Survivors is an FPO field and they use a custom red fill paint called fireball & fireball formula 40 made by pro-caps. This is the same field where tippmann hosts the Tippmann world Challenge. and we use the same fireball paint at that event. I agree with the apprehension in using red paintball with young kids, if they should be used at all it should be in an adult and experienced environment. I once knew a printing press operator who sustained a work injury while using -- you guessed it -- red ink. It was hard for medical personnel to evaluate where and how he was injured. Not what you want when you're badly injured and the folks treating you need to act quickly and appropriately.